Zombies Are Coming! Arm Yourself With Data. You already know that data can help you with pretty much everything — but have you ever thought about how it can help you in the zombie apocalypse? Amid the trick or treating, jack o'lanterns, and haunted houses that happened on Halloween, let's take a second to talk about something that really matters: the zombie apocalypse. If the zombie apocalypse started tomorrow, how prepared would you be? Do you know what state you should flee to for protection? 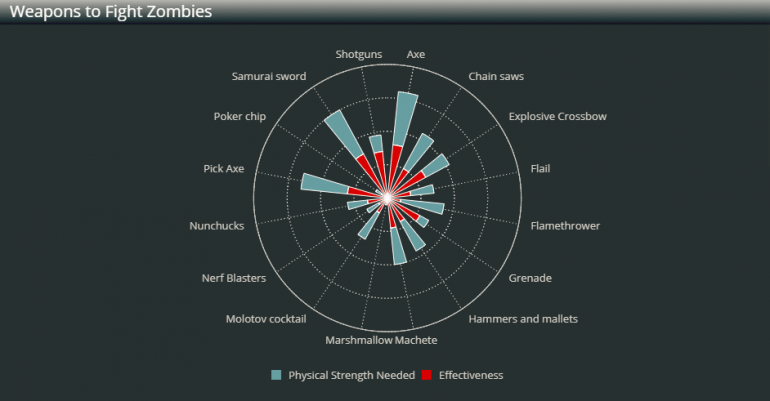 Do you know what weapons would be the most effective for survival? No? Well then, let me dig into some data for you. Most of us have pride in the place we grew up (shout out to Chicago!) or currently live, but the truth is, the place you call home may not be the safest when it comes to riding out the zombie apocalypse. In order to see which state should be your safe haven for the zombie apocalypse, we'll look at a mash-up of data by state, which takes into account variables such as the number of people per square mile, gun owners per capita, number of cemeteries, and most physically active populations. 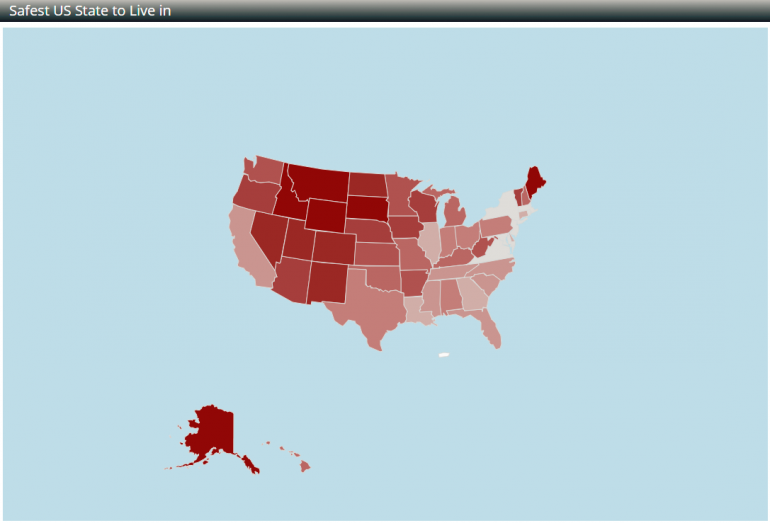 The darker the state is in the map widget below, the more secure it is when the apocalypse goes down. In terms of the safest state, it looks like Alaska is your best bet. It has the fewest people per square mile and ranks #13 for having the least amount of cemeteries, two pretty key factors when it comes to the zombie apocalypse. However, getting to Alaska might be a bit of a challenge with all the zombies roaming the streets. So if you're not up for the trek, your next best bet is to head west to either Idaho, Montana, or Wyoming. The data doesn't lie, so trust me — if you're in New York, Rhode Island, Virginia, or New Jersey, you better start thinking about your escape route now. As four of the states that rank among the highest for people per square mile, gun owners per capita, and the number of cemeteries... it won't end well for you. I know what you're thinking, "I'll have plenty of time to get out, I don't need to start planning now!" Not so fast. 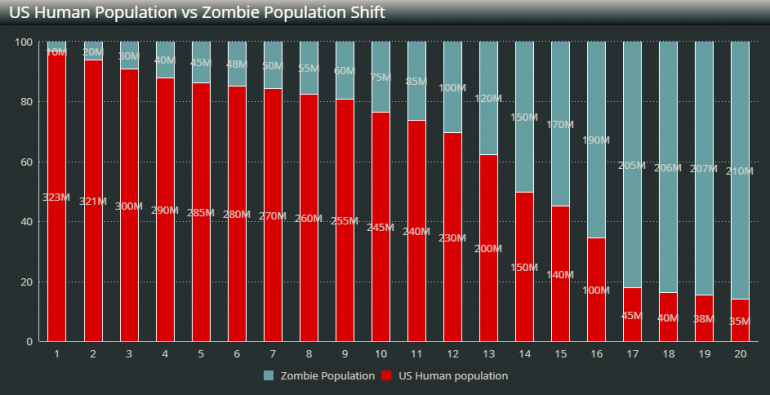 Take a look at the graph below to see just how rapidly the population will shift from human to zombie over just the first 20 days of the zombie apocalypse. If you're lucky to last long enough, after just 14 days, the number of zombies to the number of humans will be equal. By day 20, the difference between human and zombie populations will be so vast you'll be wishing you taken my advice earlier. Pack your bags. Now that you've mapped out your route to safety it's time to stock up on supplies. And by supplies, I mean weapons. Two important factors to keep in mind when it comes to weapons for the zombie apocalypse are effectiveness and physical strength needed. If we take a look at the data behind those two factors, the obvious choice is a shotgun. It's one of the more effective weapons in defeating zombies and takes a very minimal amount of physical effort. On the other hand, Nerf Blasters may be easier to acquire but they're about as effective as you'd think. But hey, stock up on a couple anyway... they'll keep you occupied in the bunker. If you're going to be trapped in a bunker for an undetermined amount of time, you better come prepared. While I personally would prefer to down a bottle of Rescue Remedy, burn some incense, and go to my happy place, maybe you'd like to get in the spirit of the apocalypse with some zombie movies. If so, let me give you some recommendations. If you're looking for a crowd pleaser, look no further than the Simon Pegg and Edgar Wright classic, Shaun of the Dead. Not only does it have the most reviews of any zombie movie on IMDB, but with 8 out of 10 stars, it also has the highest rating. At the other end of the spectrum, if you want to distract yourself with a movie that's so bad it's almost good, try the 1986 film Night of the Creeps. With an IMDB rating of 6.8 stars, it may not be the lowest rated zombie movie out there (the lowest rated, Quarantine 2: Terminal, comes in at 5.2 stars) but I can guarantee it will give you everything you love to hate from an 80's horror film. Now more than ever is the time to think about the inevitable zombie apocalypse. I'm positive you had a few friendly zombies knocking at your door looking for candy last night but today, they might be knocking for very different reasons. Catch my drift? If you want to arm yourself with even more data, may I recommend these resources?